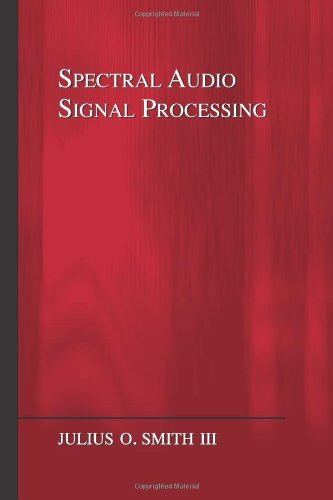 This chapter discusses use of the Short-Time Fourier Transform (STFT) to implement linear filtering in the frequency domain. Due to the speed of FFT convolution, the STFT provides the most efficient single-CPU implementation engine for most FIR filters encountered in audio signal processing. 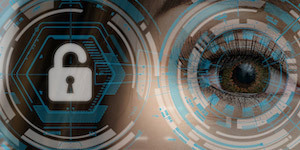 The sum over may be interpreted as adding separately filtered frames . Due to this filtering, the frames must overlap, even when the rectangular window is used. As a result, the overall system is often called an overlap-add FFT processor, or ``OLA processor'' for short. It is regarded as a sequence of FFTs which may be modified, inverse-transformed, and summed. This ``hopping transform'' view of the STFT is the Fourier dual of the ``filter-bank'' interpretation to be discussed in Chapter 9. Figure: System diagram for filtering an input signal by filter to produce output as the convolution of and . This form describes graphical convolution in which the output sample at time is computed as an inner product of the impulse response after flipping it about time 0 and shifting time 0 to time . See [264, p. 105] for an illustration of graphical convolution. For short convolutions (less than a hundred samples or so), method 1 is usually faster. However, for longer convolutions, method 2 is ultimately faster. This is because the computational complexity of direct cyclic convolution of two -point signals is , while that of FFT convolution is . More precisely, direct cyclic convolution requires multiplies and additions, while the exact FFT numbers depend on the particular FFT algorithm used [80,66,224,277]. Some specific cases are compared in §8.1.4 below. Using the Matlab test program in ,9.1FFT convolution was found to be faster than direct convolution starting at length (looking only at powers of 2 for the length ).9.2 FFT convolution was also never significantly slower at shorter lengths for which ``calling overhead'' dominates. Running the same test program in 2011,9.3 FFT convolution using the fft function was found to be faster than conv for all (power-of-2) lengths. The speed of FFT convolution divided by that of direct convolution started out at 14 for , fell to a minimum of at , above which it started to climb as expected, reaching at . Note that this comparison is unfair because the Octave fft function is a dynamically linked, separately compiled module, while conv is written in the matlab language and thus suffers more overhead from the matlab interpreter. An analysis reported in Strum and Kirk [279, p. 521], based on the number of real multiplies, predicts that the fft is faster starting at length , and that direct convolution is significantly faster for very short convolutions (e.g., 16 operations for a direct length-4 convolution, versus 176 for the fft function). See 9.4for further discussion of FFT algorithms and their applications. In digital audio, FIR filters are often hundreds of taps long. For such filters, the FFT method is much faster than direct convolution in the time domain on single CPUs. On GPUs, FFT convolution is faster than direct convolution only for much longer FIR-filter lengths (in the thousands of taps ); this is because massively parallel hardware can perform an algorithm (direct convolution) faster than a single CPU can perform an algorithm (FFT convolution). FIR filters shorter than the ear's ``integration time'' can generally be characterized by their magnitude frequency response (no perceivable ``delay effects''). The nominal ``integration time'' of the ear can be defined as the reciprocal of a critical bandwidth of hearing. Using Zwicker's definition of critical bandwidth , the smallest critical bandwidth of hearing is approximately 100 Hz (below 500 Hz). Thus, the nominal integration time of the ear is 10ms below 500 Hz. (Using the equivalent-rectangular-bandwidth (ERB) definition of critical bandwidth [179,269], longer values are obtained). At a 50 kHz sampling rate, this is 500 samples. Therefore, FIR filters shorter than the ear's ``integration time,'' i.e., perceptually ``instantaneous,'' can easily be hundreds of taps long (as discussed in the next section). FFT convolution is consequently an important implementation tool for FIR filters in digital audio applications. In this example, we design and implement a length FIR lowpass filter having a cut-off frequency at Hz. The filter is tested on an input signal consisting of a sum of sinusoidal components at frequencies Hz. We'll filter a single input frame of length , which allows the FFT to be samples (no wasted zero-padding). 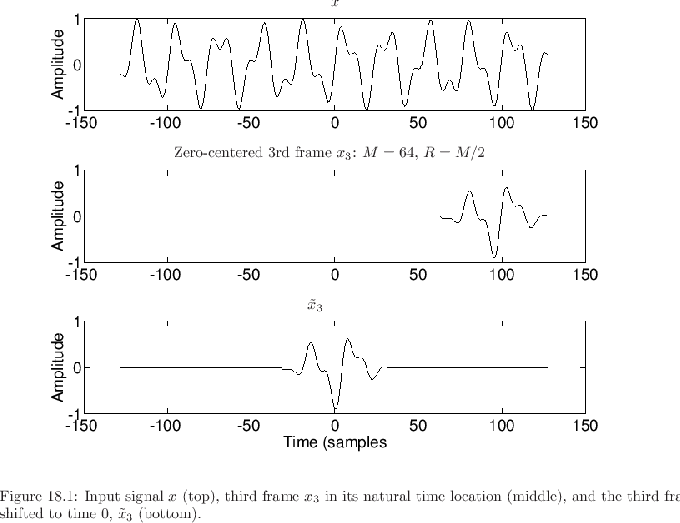 Figure 8.3: FIR filter impulse response (top) and amplitude response (bottom). Figure 8.4 shows the input signal spectrum and the filter amplitude response overlaid. We see that only one sinusoidal component falls within the pass-band. Figure 8.4: Overlay of input signal spectrum and desired lowpass filter pass-band. Figure 8.5: Output signal magnitude spectrum = magnitude of input spectrum times filter frequency response. The modified spectrum is shown in Fig.8.5. 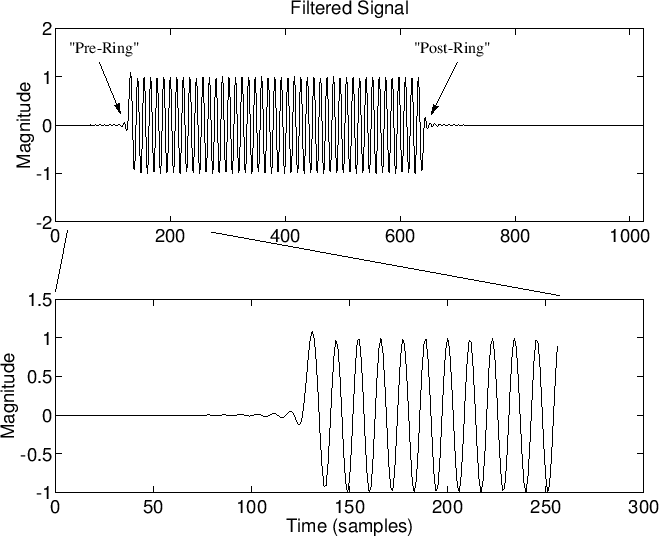 Figure 8.6: Filtered output signal, with close-up showing the filter start-up transient (``pre-ring''). For an input signal approximately samples long, this example is 2-3 times faster than the conv function in Matlab (which is precompiled C code implementing time-domain convolution). Figure 8.7 shows the effect of insufficient zero padding, which can be thought of as undersampling in the frequency domain. We will see aliasing in the time domain results. The lowpass filter length is and the input signal consists of an impulse at times and , where the data frame length is . To avoid time aliasing (i.e., to implement acyclic convolution using an FFT), we must use an FFT size at least as large as . In the figure, the FFT sizes , , and are used. Thus, the first case is heavily time aliased, the second only slightly time aliased (involving only some of the filter's ``ringing'' after the second pulse), and the third is free of time aliasing altogether. Figure 8.7: Illustration of FFT convolution with insufficient zero padding. From the top: (1) Input signal (two impulses) and lowpass-filter impulse response; (2) heavily time-aliased convolution in which the second filter impulse has wrapped around to low times; (3) slightly time-aliased result in which some of the filter ``post-ring'' from the second pulse wraps around; (4) result with no time aliasing. One or both of the signals being convolved is very long. Thus, at every time , the output can be computed as a linear combination of the current input sample and the current filter state . To obtain the benefit of high-speed FFT convolution when the input signal is very long, we simply chop up the input signal into blocks, and perform convolution on each block separately. The output is then the sum of the separately filtered blocks. The blocks overlap because of the ``ringing'' of the filter. For a zero-phase filter, each block overlaps with both of its neighboring blocks. For causal filters, each block overlaps only with its neighbor to the right (the next block in time). The fact that signal blocks overlap and must be added together (instead of simply abutted) is the source of the name overlap-add method for FFT convolution of long sequences [7,9]. The idea of processing input blocks separately can be extended also to both operands of a convolution (both and in ). The details are a straightforward extension of the single-block-signal case discussed below. When simple FFT convolution is being performed between a signal and FIR filter , there is no reason to use a non-rectangular window function on each input block. A rectangular window length of samples may advance samples for each successive frame (hop size samples). In this case, the input blocks do not overlap, while the output blocks overlap by the FIR filter length (minus one sample). On the other hand, if nonlinear and/or time-varying spectral modifications to be performed, then there are good reasons to use a non-rectangular window function and a smaller hop size, as we will develop below. 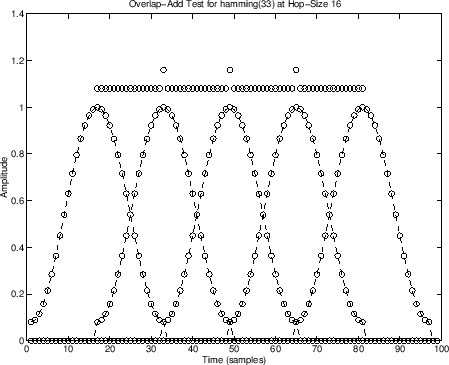 The hop size is the number of samples between the begin-times of adjacent frames. Specifically, it is the number of samples by which we advance each successive window. 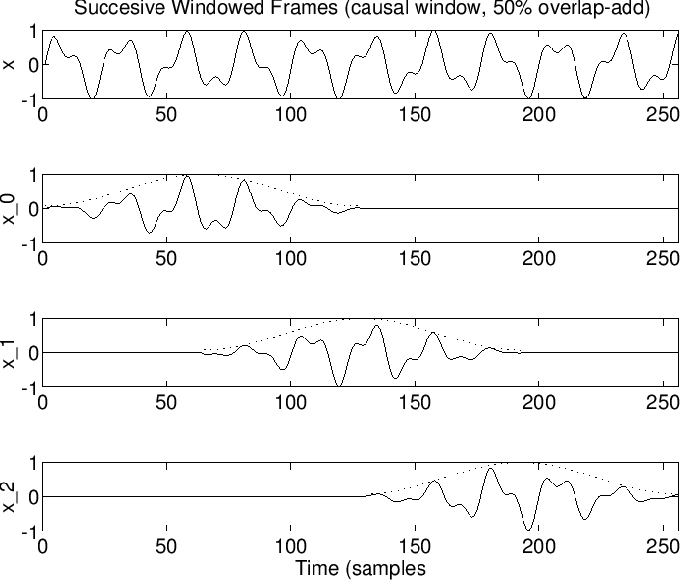 Figure 8.8 shows an input signal (top) and three successive windowed data frames using a length causal Hamming window and 50% overlap ( ). 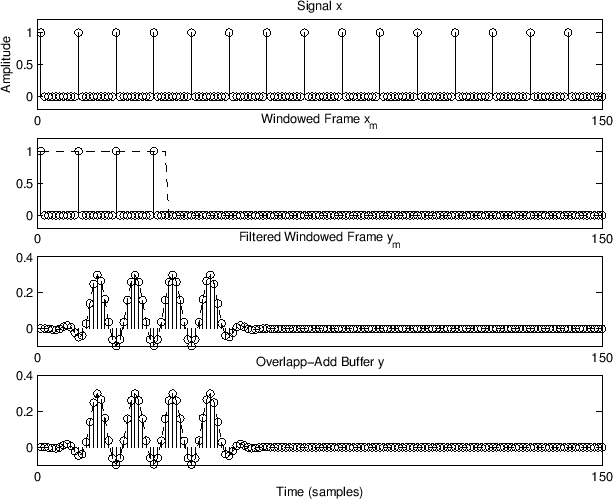 Figure 8.8: Input signal (top) and three successive windowed data frames. This is the constant-overlap-add (COLA)9.6 constraint for the FFT analysis window . It has also been called the partition of unity property. The figure produced by this matlab code is shown in Fig.8.10. As can be seen, the equal end-points sum to form an impulse in each frame of the overlap-add. Figure 8.10: Overlap-add example for the default Hamming window in Matlab. where m = (0:M-1)/(M-1), gives constant overlap-add for when is odd and is an integer, and when is even and is integer. 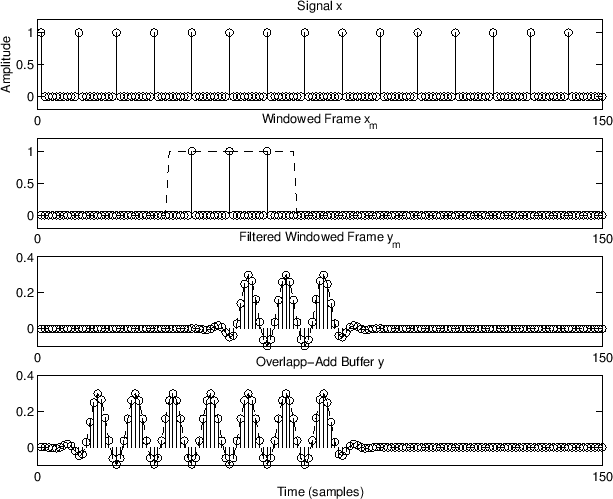 In summary, all windows obeying the constant-overlap-add constraint will yield perfect reconstruction of the original signal from the data frames by overlap-add (OLA). There is no constraint on window type, only that the window overlap-adds to a constant for the hop size used. In particular, always yields a constant overlap-add for any window function. We will learn later (§8.3.1) that there is also a simple frequency-domain test on the window transform for the constant overlap-add property. To emphasize an earlier point, if simple time-invariant FIR filtering is being implemented, and we don't need to work with the intermediate STFT, it is most efficient to use the rectangular window with hop size , and to set , where is the length of the filter and is a convenient FFT size. The optimum for a given is an interesting exercise to work out. Any member of the -term Blackman-Harris family with . Recall from §3.2.6, that many audio coders use the MLT sine window. The window is applied twice: once before the FFT (the ``analysis window'') and secondly after the inverse FFT prior to reconstruction by overlap-add (the so-called ``synthesis window''). Since the window is effectively squared, it functions as a Hann window for overlap-add purposes (a member of the Generalized Hamming family). As such, it can be used with 50% overlap. More generally, any positive COLA window can be split into an analysis and synthesis window pair by taking its square root. This is summarized in Fig.8.11. 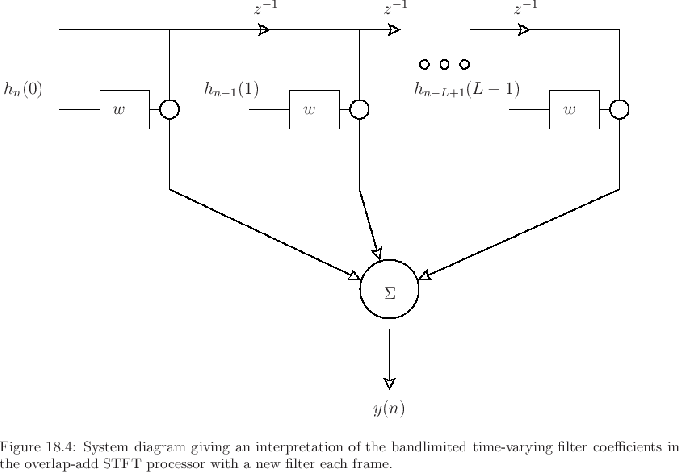 Zero-based frames are needed because the leftmost input sample is assigned to time zero by FFT algorithms. In other words, a hopping FFT effectively redefines time zero on each hop. Thus, a practical STFT is a sequence of FFTs of the zero-based frames . On the other hand, papers in the literature (such as [7,9]) work with the fixed time-origin case ( ). Since they differ only by a time shift, it is not hard to translate back and forth. 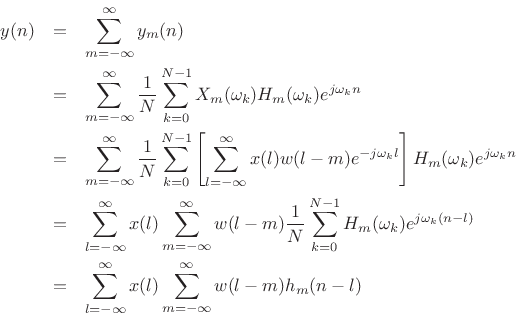 where denotes modulo indexing (appropriate since the DTFTs have been sampled at intervals of ). or less along the unit circle. This is the dual of the usual sampling theorem. where is the length DFT of the zero-padded frame , and is the length DFT of , also zero-padded out to length , with . Note that the terms in the outer sum overlap when even if . In general, an LTI filtering by increases the amount of overlap among the frames. 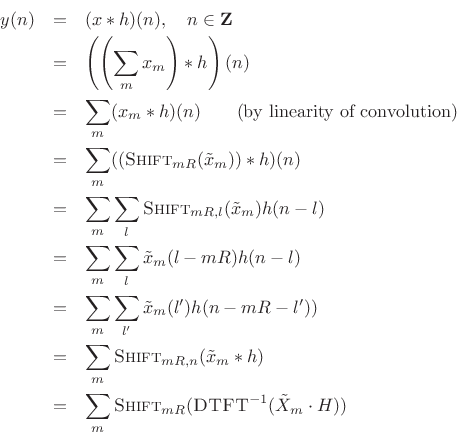 This completes our derivation of FFT convolution between an indefinitely long signal and a reasonably short FIR filter (short enough that its zero-padded DFT can be practically computed using one FFT). The fast-convolution processor we have derived is a special case of the Overlap-Add (OLA) method for short-time Fourier analysis, modification, and resynthesis. See [7,9] for more details. 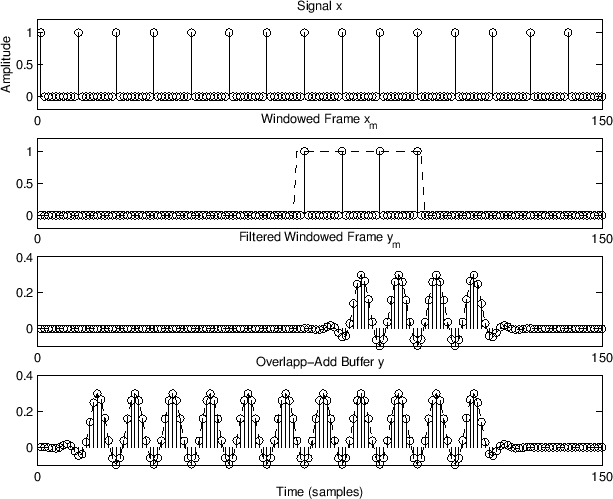 The time waveforms for the first three frames ( ) are shown in Figures 8.12 through 8.14. 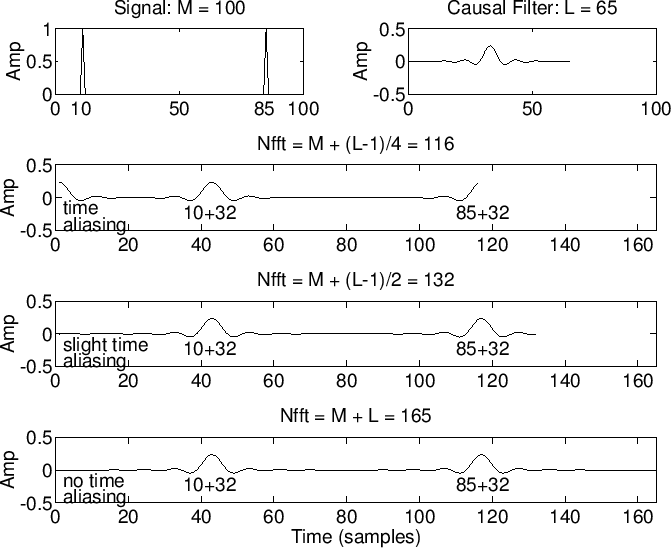 Notice how the causal linear-phase filtering results in an overall signal delay by half the filter length. Also, note how frames 0 and 2 contain four impulses, while frame 1 only happens to catch three; this causes no difficulty, and the filtered result remains correct by superposition. Figure 8.12: OLA Example, Frame 0. Figure 8.13: OLA Example, Frame 1. Figure 8.14: OLA Example, Frame 2. Extract the th length frame of data at time . Shift it to the base time interval (or ). Optionally apply a length analysis window (causal or zero phase, as preferred). For simple LTI filtering, the rectangular window is fine. Zero-pad the windowed data out to the FFT size (a power of 2), such that , where is the FIR filter length. Apply the filter frequency-response as a windowing operation in the frequency domain. Take the -point inverse FFT. Shift the origin of the -point result out to sample where it belongs. Sum into the output buffer containing the results from prior frames (OLA step). The condition is necessary to avoid time aliasing, i.e., to implement acyclic convolution using an FFT; this condition is equivalent to a minimum sampling-rate requirement in the frequency domain. In this section, we will derive the Fourier dual of the Constant OverLap-Add (COLA) condition for STFT analysis windows (discussed in §7.1). Recall that for perfect reconstruction using a hop-size of samples, the window must be . We will find that the equivalent frequency-domain condition is that the window transform must have spectral zeros at all frequencies which are a nonzero multiple of . Following established nomenclature for filter banks, we will say that such a window transform is . where (harmonics of the frame rate). Let us now consider these equivalent signals as inputs to an LTI system, with an impulse response given by , and frequency response equal to . This second form follows from the fact that complex sinusoids are eigenfunctions of linear systems--a basic result from linear systems theory [264,263]. Note that the PSF is the Fourier dual of the sampling theorem , [264, Appendix G]. The continuous-time PSF is derived in §B.15. The ``Nyquist( )'' property for a function simply means that is zero at all nonzero multiples of (all harmonics of the frame rate here). We may also refer to (8.33) as the ``weak COLA constraint'' in the frequency domain. It gives necessary and sufficient conditions for perfect reconstruction in overlap-add FFT processors. However, when the short-time spectrum is being modified, these conditions no longer apply, and a stronger COLA constraint is preferable. This condition is sufficient, but not necessary, for perfect OLA reconstruction. Strong COLA implies weak COLA, but it cannot be achieved exactly by finite-duration window functions. That is, the overlap-add of the window at hop-size is equal numerically to the dc gain of the window divided by . Above, we used the Poisson Summation Formula to show that the constant-overlap-add of a window in the time domain is equivalent to the condition that the window transform have zero-crossings at all harmonics of the frame rate. In this section, we look briefly at the dual case: If the window transform is COLA in the frequency domain, what is the corresponding property of the window in the time domain? As one should expect, being COLA in the frequency domain corresponds to having specific uniform zero-crossings in the time domain. Bandpass filters that sum to a constant provides an ideal basis for a graphic equalizer. In such a filter bank, when all the ``sliders'' of the equalizer are set to the same level, the filter bank reduces to no filtering at all, as desired. Thus, using the dual of the PSF, we have found that a good -channel equalizer filter bank can be made using bandpass filters which have zero-crossings at multiples of samples, because that property guarantees that the filter bank sums to a constant frequency response when all channel gains are equal. 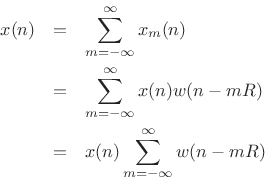 The duality introduced in this section is the basis of the Filter-Bank Summation (FBS) interpretation of the short-time Fourier transform, and it is precisely the Fourier dual of the OverLap-Add (OLA) interpretation . The FBS interpretation of the STFT is the subject of Chapter 9. Using ``square-root windows'' in the WOLA context, the valid hop sizes are identical to those for in the OLA case. More generally, given any window for use in a WOLA system, it is of interest to determine the hop sizes which yield perfect reconstruction. where is the analysis window and is the synthesis window. For the rectangular window, , and (since is a sinc function which reduces to when , and . For the Hamming window, the critically sampled window transform has three nonzero samples (where the rectangular-window transform has one). Therefore, has nonzero samples at critical sampling. Measuring main-lobe width from zero-crossing to zero-crossing as usual, we get radians per sample, or ``6 side lobes'', for the width of . The squared-Blackman window transform width is . The square of a length -term Blackman-Harris-family window (where rect is , Hann is , etc.) has a main lobe of width , measured from zero-crossing to zero-crossing in ``side-lobe units'' ( ). This is up from for the original -term window. The width of the main lobe can be used to determine the hop size in the STFT, as will be discussed further in Chapter 9. Note that we need only find the first zero-crossing in the window transform for any member of the Blackman-Harris window family (Chapter 3), since nulls at all harmonics of that frequency will always be present (at multiples of ). overlaps the input frames by the same amount. If the input frame size is and the filter length is , then a length FFT and IFFT are used. As a result, samples of the output are invalid due to time aliasing. The overlap-save method writes out the good samples and uses a hop size of , thus recomputing the time-aliased output samples in the previous frame. The name ``overlap-save'' comes from the fact that samples of the previous frame are ``saved'' for computing the next frame. describes the time variation of the tap. is a filtered version of the tap . 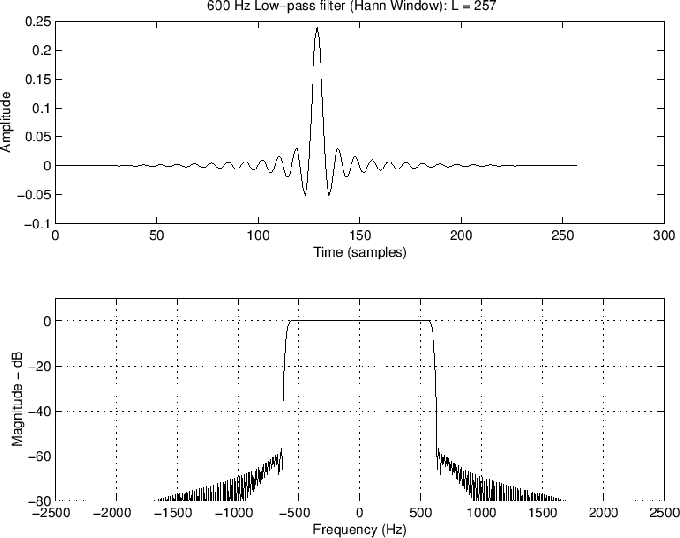 It is lowpass-filtered by w and delayed by samples. Denote the th time-varying, lowpass-filtered, delayed-by- filter tap by . This can be interpreted as the weighting in the output at time of an impulse entering the time-varying filter at time . This is a superposition sum for an arbitrary linear, time-varying filter . This is depicted in Fig.8.17. The term can be interpreted as the FIR filter tap at time . Note how each tap is lowpass filtered by the FFT window . The window thus enforces bandlimiting each filter tap to the bandwidth of the window's main lobe. For an -term length- Blackman-Harris window, for example, the main-lobe reaches zero at frequency (see Table 5.2 in §5.5.2 for other examples). This bandlimiting places a limit on the bandwidth expansion caused by time-variation of the filter coefficients, which in turn places a limit on the maximum STFT hop-size that can be used without frequency-domain aliasing. See Allen and Rabiner 1977  for further details on the bandlimiting property. This is the general length time-varying FIR filter convolution sum for time , when is odd. Output windows are important in audio compression applications for minimizing ``blocking effects.'' The synthesis window ``fades out'' any spectral coding error at the frame boundaries, thereby suppressing audible discontinuities. Output windows are not used in simple FFT convolution processors because the input frames are supposed to be expanded by the convolution, and a synthesis window would ``pinch off'' the ``filter ringing'' from each block, yielding incorrect results. Output windows can always be used in conjunction with spectral modifications made by means of the ``filter bank summation'' (FBS) method, which is the subject of the next chapter. Extract the th windowed frame of data , (assuming a length causal window and hop size ). Process as desired to produce . Inverse FFT to produce , . Apply a synthesis window to to yield a weighted output frame , . Translate the th output frame to time as and add to the accumulated output signal . We can say that -shifts of the window in the time domain are power complementary, whereas for OLA they were amplitude complementary. Notice that the root-Hann window is the same thing as the ``MLT Sine Window'' described in §3.2.6. We can similarly define the ``root-Hamming'', ``root-Blackman'', and so on, all of which give perfect reconstruction in the weighted overlap-add context.